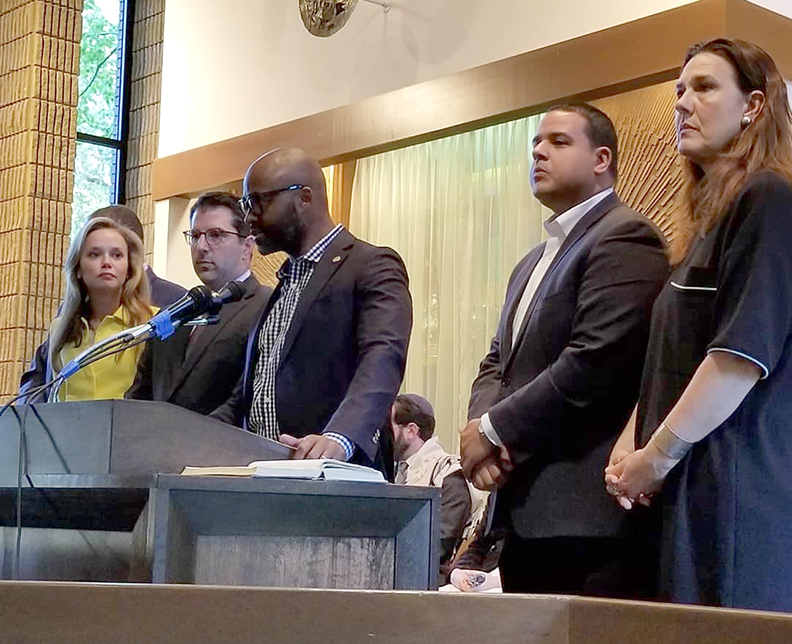 One day after 11 Jews were murdered during Shabbat services at Tree of Life in Pittsburgh, an overflow crowd filled the sanctuary and social hall of Shir Chadash in Metairie for a community vigil. Members of the general community joined with representatives of every branch of the local Jewish community in the Oct. 28 memorial service, which concluded with the placing of hundreds of stones on the steps of the pulpit, reminiscent of the practice at Jewish cemeteries. Shir Chadash, like Tree of Life in Pittsburgh, is a Conservative congregation. Shir Chadash President Julie Finger said “it is tremendously touching to see such an outpouring of support from the greater New Orleans community,” with over 500 in attendance for the quickly-called event. Rabbi Deborah Silver of Shir Chadash spoke of the symbolism of the tree in Jewish lore, starting with the Tree of Life, the Etz Chaim, which first referred to wisdom, and later to Torah. “When the congregation called Etz Chaim has been so cruelly struck, then it falls to us, each of us in this room, each of us in this community, each of us in this city, each of us across the world to be that tree, to be an etz chaim, each of us in our way,” she said. Beth Israel Rabbi Gabe Greenberg led the El Malei Rachamim, reciting the 11 names. He said usually when it is recited graveside, it is for a peaceful transition for the departed from this world to the next, but in this circumstance, “I struggle.” He also urged those in attendance to focus on the 11 and consider what to do upon waking up tomorrow, to help prevent such attacks in the future. Rabbi Matt Reimer of Temple Sinai referenced a favorite saying of Mr. Rogers, whose real-life neighborhood was in Pittsburgh. In bad situations, “always look for the helpers,” he reminded. Reimer led an English Kaddish that was written to be recited after gun violence, then led the crowd in Kaddish in Hebrew. More information will be coming in the weeks ahead, he added. Numerous political leaders also spoke, starting with U.S. Representative Steve Scalise, who was severely wounded last year as a gunman opened fire on a baseball practice for Republicans in Congress. Many members of the New Orleans City Council spoke, led by Council President Jason Williams, who reached out to ZBT brothers around the country. “There was a lot of anger,” he said. She said, “the local Catholic community actually has a prayer that we recite every Sunday — it’s our Family Prayer — and part of it says ‘Give us the perseverance to be a voice for life and human dignity’. Councilman Jay Banks took a different angle, saying he was “sick and tired of having to come to these. In the middle of the service, Temple Sinai Cantor Joel Colman, Gates of Prayer Cantorial Soloist Tory May and Touro Synagogue Cantor Kevin Margolius led the crowd in “Heal Us Now,” a song May said was “very familiar for a lot of us in 2005” after Katrina. The final line of the Kaddish, “Oseh Shalom,” a prayer for peace, was also the closing song, led by Colman, May and Margolious. After the conclusion, Silver invited everyone to bring a stone and place it on the steps of the bimah before filing out.